For producer use only. Not for use with consumers. This presentation is not for use in California. 12646 (2/07) Effective Multi-Life Marketing Meeting. 4 ©1999-2005 StanCorp Financial Group, Inc. For producer training use only. Not for use with consumers. 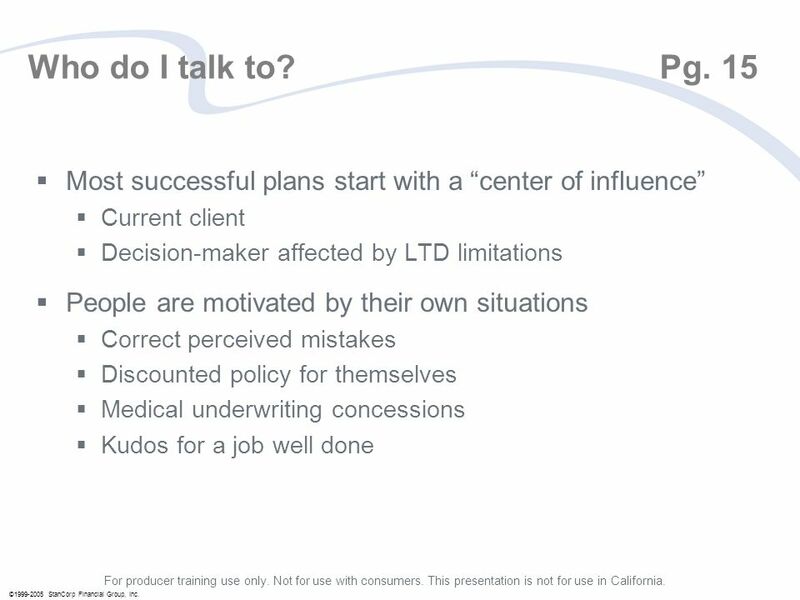 This presentation is not for use in California. Disability Concerns Pg. 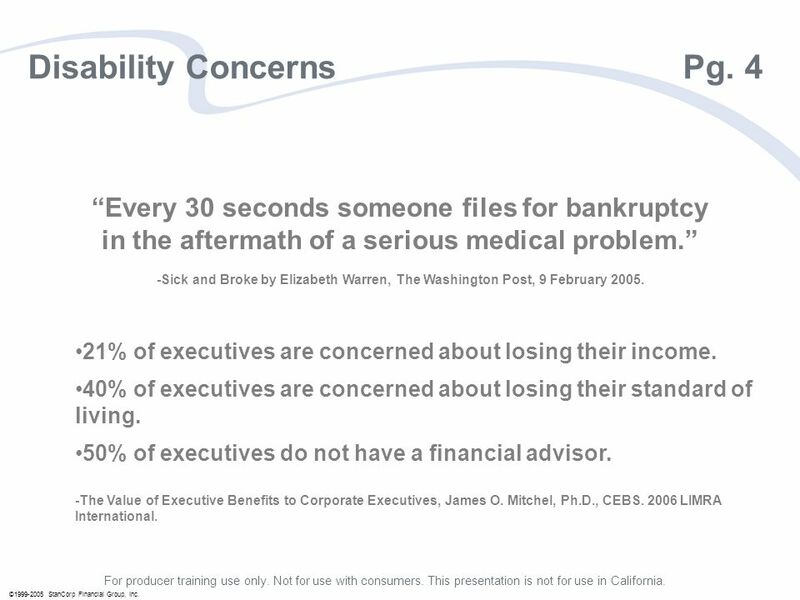 4 Every 30 seconds someone files for bankruptcy in the aftermath of a serious medical problem. -Sick and Broke by Elizabeth Warren, The Washington Post, 9 February 2005. 21% of executives are concerned about losing their income. 40% of executives are concerned about losing their standard of living. 50% of executives do not have a financial advisor. -The Value of Executive Benefits to Corporate Executives, James O. Mitchel, Ph.D., CEBS. 2006 LIMRA International. 5 ©1999-2005 StanCorp Financial Group, Inc. For producer training use only. Not for use with consumers. This presentation is not for use in California. Duration of Long-Term Disability Pg. 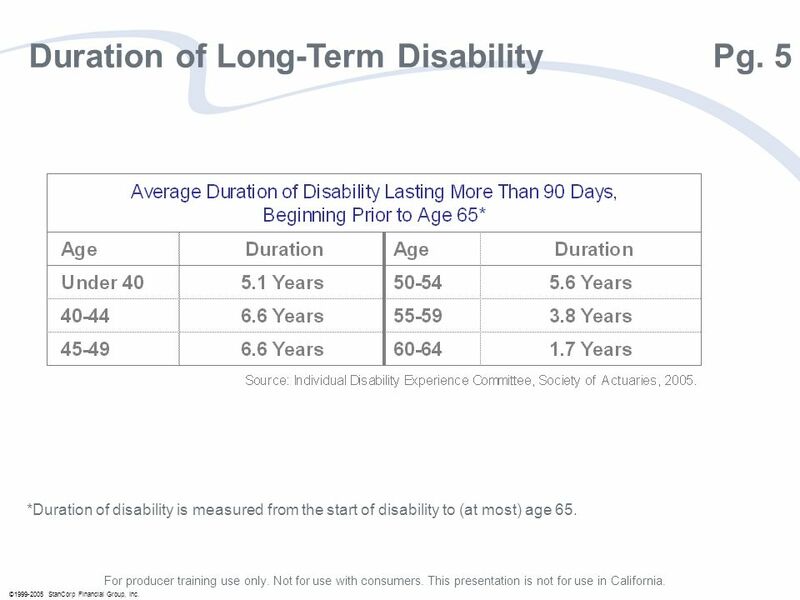 5 *Duration of disability is measured from the start of disability to (at most) age 65. 8 ©1999-2005 StanCorp Financial Group, Inc. For producer training use only. Not for use with consumers. 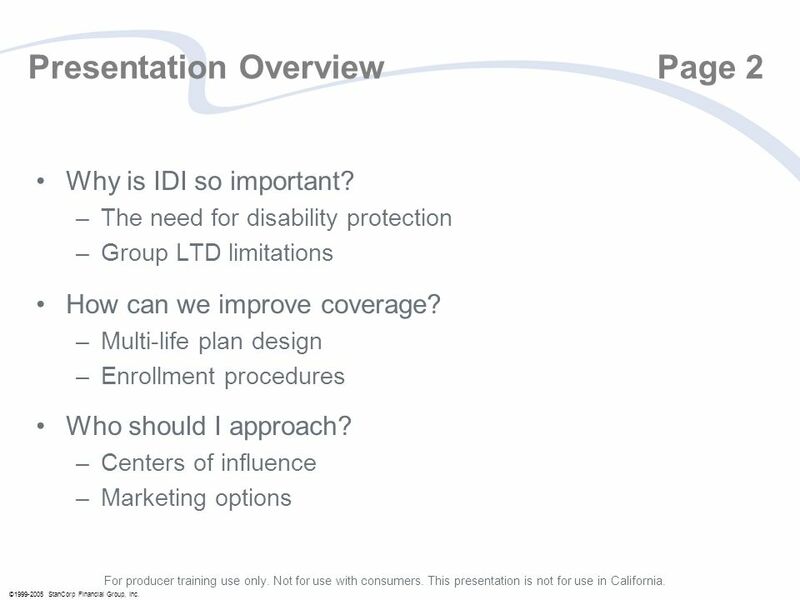 This presentation is not for use in California. 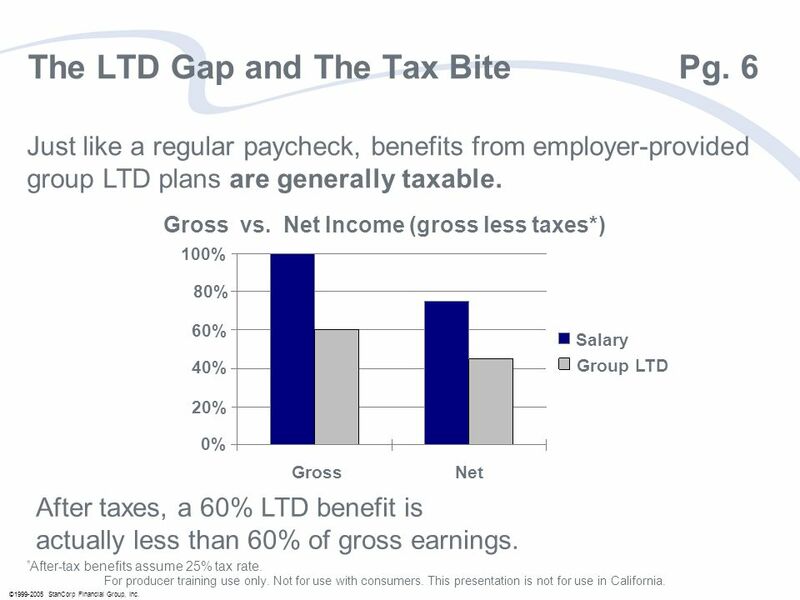 Higher earnings mean less coverage Pg. 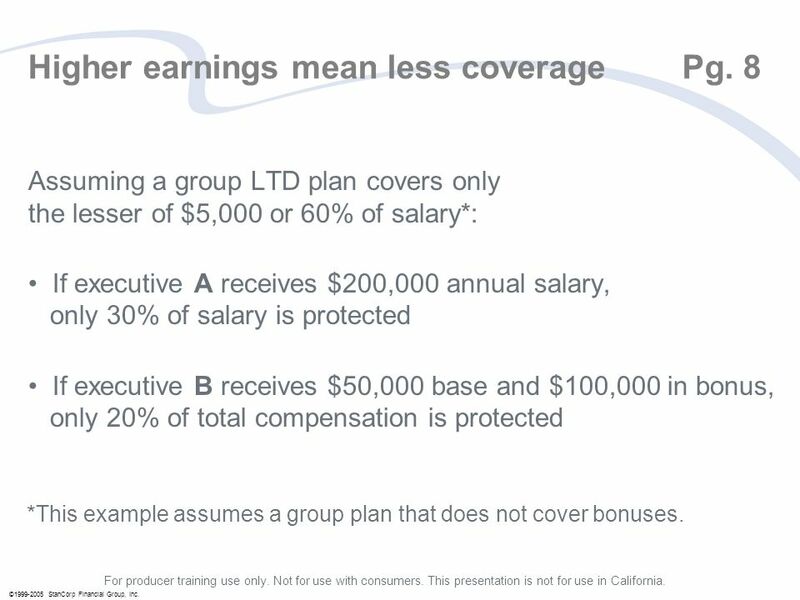 8 Assuming a group LTD plan covers only the lesser of $5,000 or 60% of salary*: If executive A receives $200,000 annual salary, only 30% of salary is protected If executive B receives $50,000 base and $100,000 in bonus, only 20% of total compensation is protected *This example assumes a group plan that does not cover bonuses. 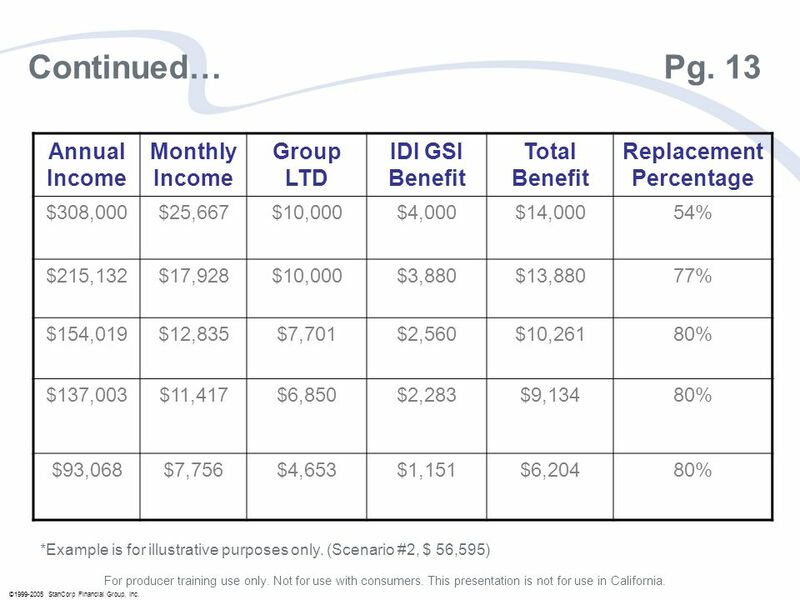 9 ©1999-2005 StanCorp Financial Group, Inc. For producer training use only. Not for use with consumers. This presentation is not for use in California. 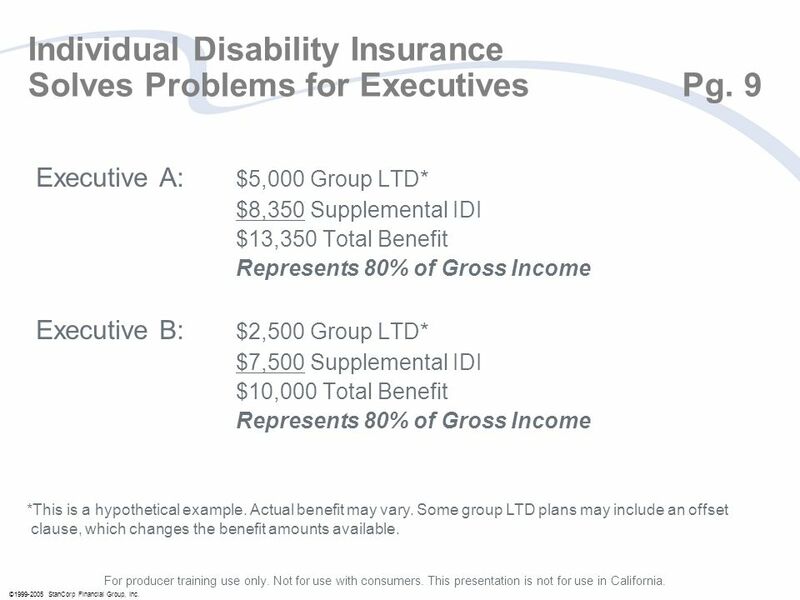 Individual Disability Insurance Solves Problems for Executives Pg. 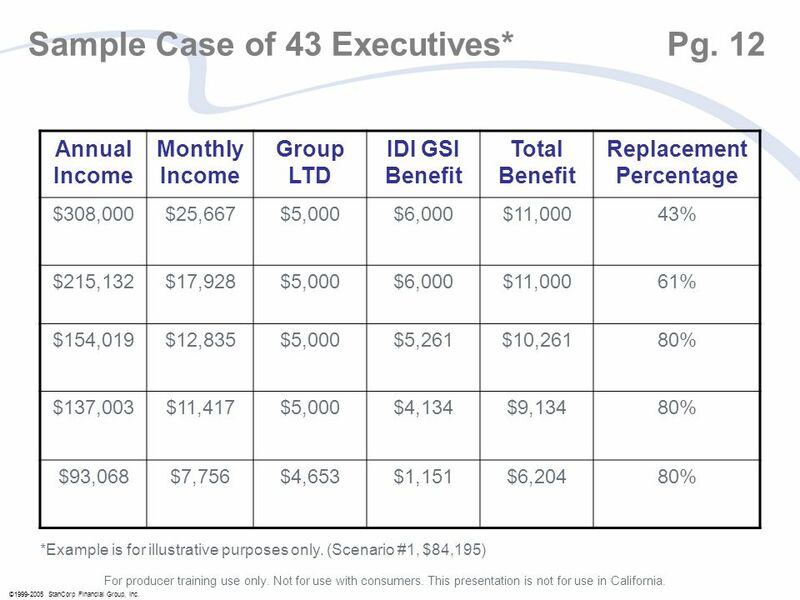 9 Executive A: $5,000 Group LTD* $8,350 Supplemental IDI $13,350 Total Benefit Represents 80% of Gross Income Executive B: $2,500 Group LTD* $7,500 Supplemental IDI $10,000 Total Benefit Represents 80% of Gross Income *This is a hypothetical example. Actual benefit may vary. 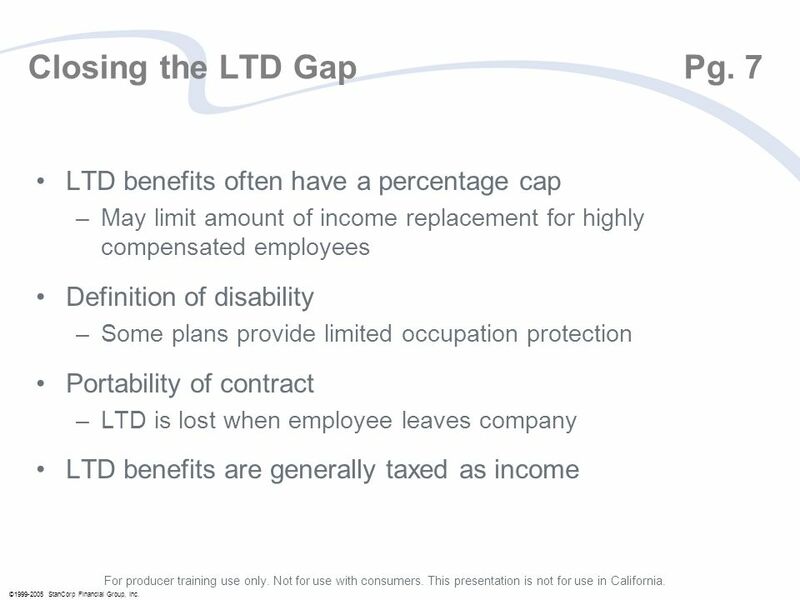 Some group LTD plans may include an offset clause, which changes the benefit amounts available. 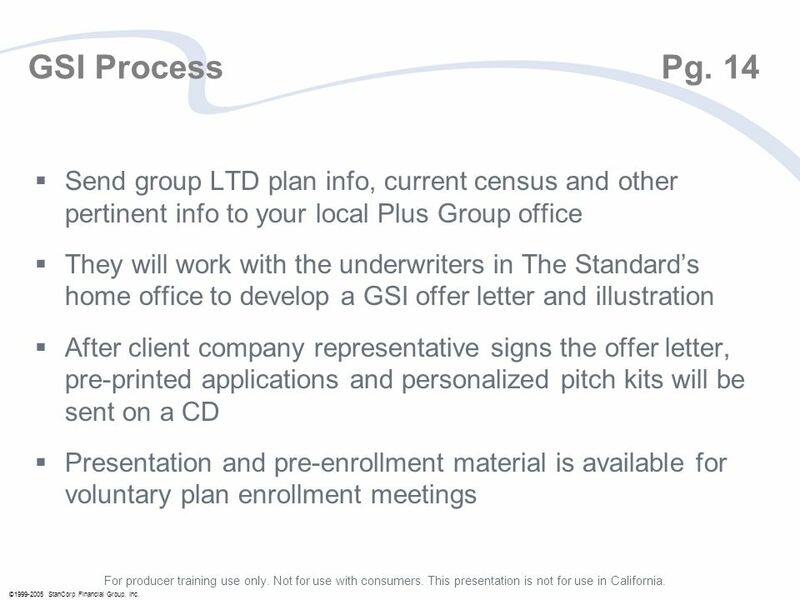 11 ©1999-2005 StanCorp Financial Group, Inc. For producer training use only. Not for use with consumers. This presentation is not for use in California. How is this done? Pg. 11 Guaranteed Standard Issue No medical underwriting and limited financial requirements! 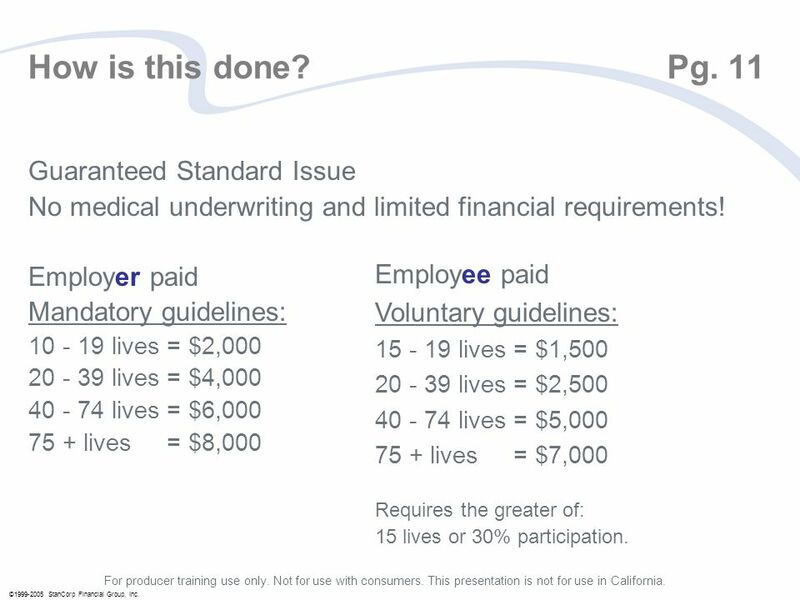 Employer paid Mandatory guidelines: 10 - 19 lives = $2,000 20 - 39 lives = $4,000 40 - 74 lives = $6,000 75 + lives = $8,000 Employee paid Voluntary guidelines: 15 - 19 lives = $1,500 20 - 39 lives = $2,500 40 - 74 lives = $5,000 75 + lives = $7,000 Requires the greater of: 15 lives or 30% participation. 16 For producer use only. Not for use with consumers. This presentation is not for use in California. 12646 (2/07) Thank you for your participation! Please contact your local Plus Group office for more information. 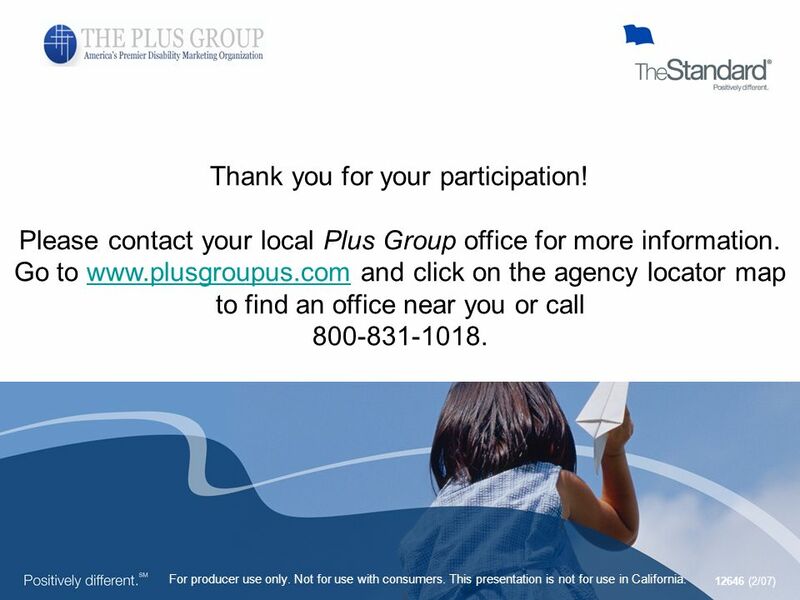 Go to www.plusgroupus.com and click on the agency locator map to find an office near you or callwww.plusgroupus.com 800-831-1018. Download ppt "For producer use only. Not for use with consumers. This presentation is not for use in California. 12646 (2/07) Effective Multi-Life Marketing Meeting." APRIL UK Corporate Services Employee Benefit Specialists. 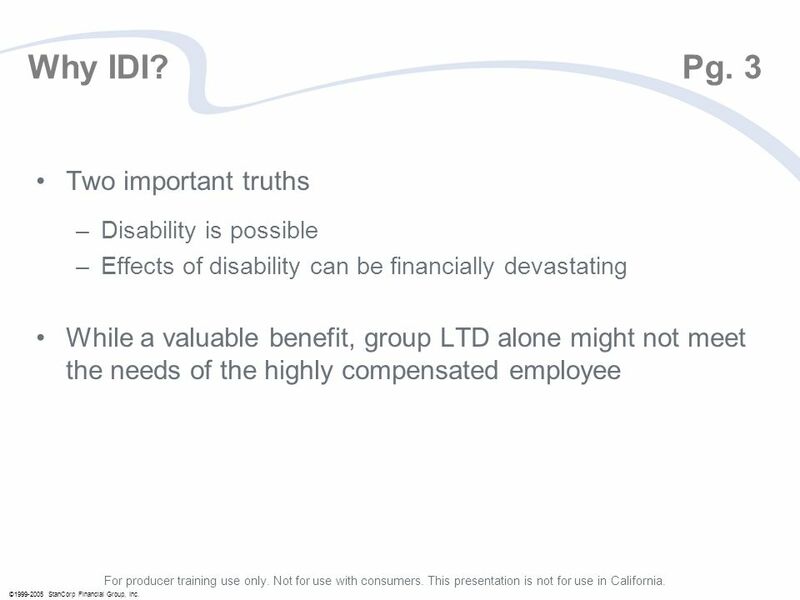 Principal Life Insurance Company Protect Business Owners Against Disabilitys Triple Threat Presented By: Don Schamay, CFP Disability Income Regional Vice. 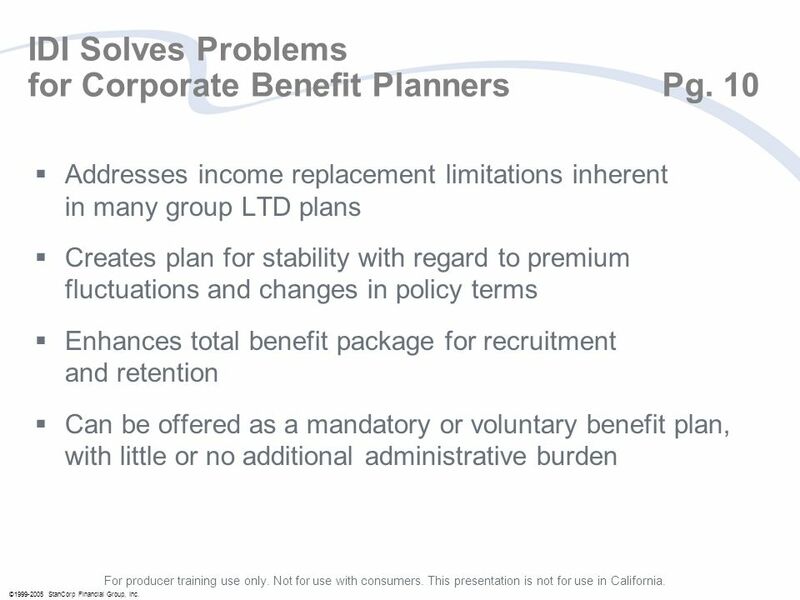 Employee Benefits 2011: Back to Basics Achieve Financial Group, LLC (Press the Space Bar to advance each slide. This presentation does not feature a voice. RISK MANAGEMENT Chapter Nine Copyright © 2014 by The McGraw-Hill Companies, Inc. All rights reserved.McGraw-Hill/Irwin.